Rated PG-13 for thematic material including war atrocities, violence and disturbing images, and for some sexuality. The Belfast-born writer and director Terry George is most at home in settings where there are troubles, and sorry about the unintentional play on words. With director Jim Sheridan he crafted two of the most searing and memorable films about his homeland and its tortured history, 1993’s “In the Name of the Father” and 1997’s “The Boxer,” both starring Daniel Day-Lewis. When he’s been behind the camera himself, he hasn’t chosen rom-coms: his 1998 HBO movie “A Bright Shining Lie” treated the Vietnam debacle from a particular military perspective, and 2004’s “Hotel Rwanda” took a focused look at one man’s action against the Rwandan genocide. Even George’s little-seen 2007 domestic tragedy “Reservation Road” had a larger point about societal ills animating its core. 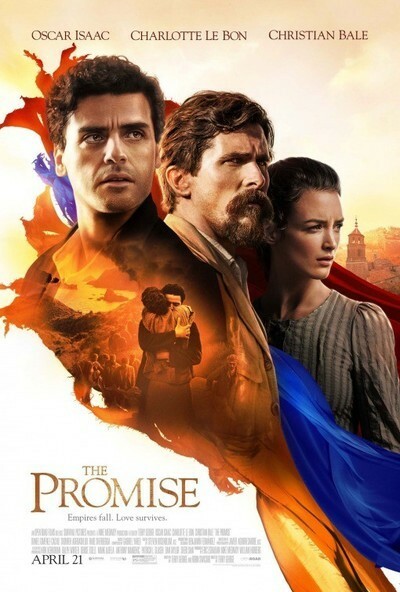 With “The Promise,” George, co-writing with Robin Swicord, treats the Armenian genocide of the early part of the 20th century, an action undertaken by the soon-to-be-displaced Ottoman Empire, as a side exercise in its alliance with Germany as World War I was about to break out. Well over a million souls were killed in this action, which the contemporary Turkish government still declines to acknowledge. Indeed, the recent movie “The Ottoman Lieutenant,” set in the same period as this one, is produced in part by Turkish interests and has several scenes in which there’s a pronounced “whatever Armenians WERE killed kind of had it coming” vibe. And this film has been preemptively down-voted on IMDb by Armenian genocide deniers. One nice thing about George is that when he takes on a subject, he doesn’t flinch or back down about the truths he needs to convey. But it’s hard to deny that in some respects, “The Promise” takes a long way to getting around to the meat of the story. George and Swicord have chosen to focus the story around a love triangle. Young Mikael Boghosian, an apothecary from a village in Southern Turkey, betroths himself to a young woman from a family of means in order to go to Constantinople to attend medical school. At the house of the well-off relative with whom he’s lodging, he meets the beautiful Anna, an artist who’s also Armenian. Anna is married to Chris Myers, a committed American journalist who’s also a hard-headed hard drinker. You see where this is going. As Mikael, Oscar Isaac doesn’t settle into his role right away, perhaps because for a while there isn’t much of a role to settle into. He is the embodiment of goodness, of earnestness. Making a friend at the institute where he’s enrolled, the fellow student asks “So you’ve already studied medicine?” and Mikael answers, “Yes, it’s my passion,” and all the ingenuousness Isaac can bring to bear on the character doesn’t rescue the line. Once he admits his passion to Anna, he also reminds himself and her that he is indeed promised to another. Anna, in an excellent portrayal by Charlotte Le Bon, is the one who winds up pushing the issue. If Christian Bale’s performance as Chris has the most vigor and intelligence, it’s at least in part because the troubled character himself has those traits in the most abundance. Alliances are formed, trusts are broken, and then history intrudes; these three characters lose and find each other time and again as war destroys everything around them in each of the environments they travel to. For Mikael, that’s initially a prison camp, where after a depiction of the depredations of hard labor, a dramatic incident involving “weeping” dynamite affords him his escape. He then returns to his village, where he does marry Maral, the young woman he’d left behind; the couples’ families hide them in a mountain cabin, and Mikael grows to love his bide. The theme of the good man who becomes a devoted husband while secretly loving another from afar is reminiscent of “Doctor Zhivago.” But while Anna and Myers take up resistance to the Armenian “evacuations” at a Protestant Mission, the Turkish exterminators are rampaging. The movie hits its cinematic stride, as it happens, when events are at their worst. "The Promise" is drenched in production value and replete with ravishing shots of sunrises and sunsets, but it’s in the scenes of fleeing, of battle, and of horrendous loss that the film is at its most effective. The depiction of the savagery inflicted on Armenia is bracing. George is determined to make his story as much about the dead as about the fictional survivors. It’s in that respect that “The Promise” earns its unsettling honor.